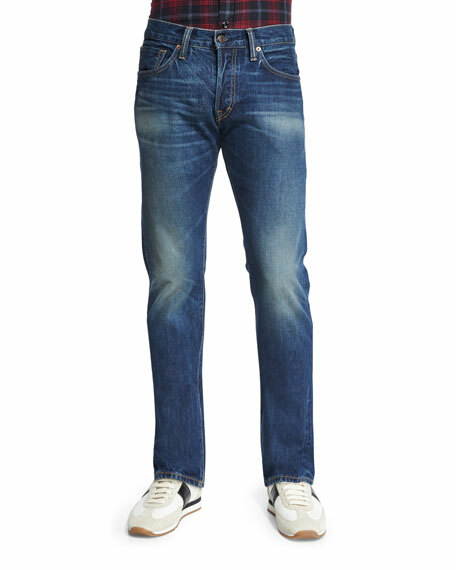 Tom Ford selvedge denim jeans in stone-wash. Applied hand treatments like sanding, tacking and tinting for a vintage look. Straight-fit style with slightly contoured thigh and minimal tapered leg; classic rise. 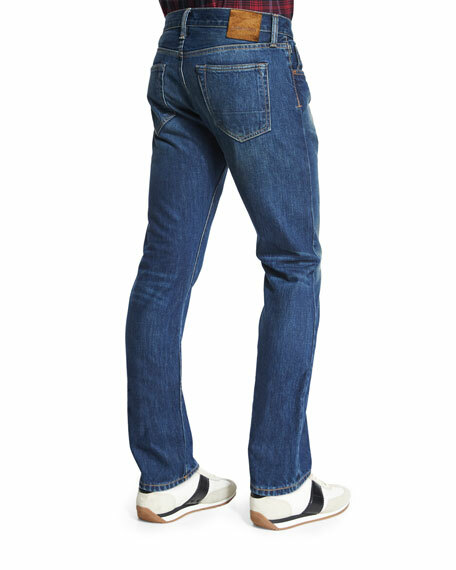 Five-pocket style with "TF" logo rivets; hand-set back pockets. Tom Ford branded suede logo patch at back waist. Keyhole button fastening with triple-fold fly construction; belt loops. Signature "T" stitch found on fly and hip. Model's measurements: Height 6'1.5"/187cm, waist 31"/79cm, suit 38L, shirt 15x34, inseam 32"/81cm. For in-store inquiries, use sku #116930.